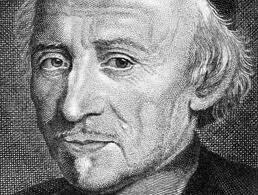 August 19 is the feastday of John Eudes. How little we know where God’s grace will lead. Born on a farm in northern France, John died at 79 in the next “county” or department. In that time he was a religious, a parish missionary, founder of two religious communities and a great promoter of the devotion to the Sacred Heart and the Immaculate Heart of Mary. He joined the religious community of the Oratorians and was ordained a priest at 24. During severe plagues in 1627 and 1631, he volunteered to care for the stricken in his own diocese. Lest he infect his fellow religious, he lived in a huge cask in the middle of a field during the plague. At age 32, John became a parish missionary. His gifts as preacher and confessor won him great popularity. He preached over 100 parish missions, some lasting from several weeks to several months. In his parish mission work, John was disturbed by the sad condition of prostitutes who sought to escape their miserable life. Temporary shelters were found but arrangements were not satisfactory. A certain Madeleine Lamy, who had cared for several of the women, one day said to him, “Where are you off to now? To some church, I suppose, where you’ll gaze at the images and think yourself pious. And all the time what is really wanted of you is a decent house for these poor creatures.” The words, and the laughter of those present, struck deeply within him. The result was another new religious community, called the Sisters of Charity of the Refuge. He is probably best known for the central theme of his writings: Jesus as the source of holiness, Mary as the model of the Christian life. His devotion to the Sacred Heart and to the Immaculate Heart of Mary led Pius XI to declare him the father of the liturgical cult of the Hearts of Jesus and Mary. Holiness is the wholehearted openness to the love of God. It is visibly expressed in many ways, but the variety of expression has one common quality: concern for the needs of others. In John’s case, those who were in need were plague-stricken people, ordinary parishioners, those preparing for the priesthood, prostitutes and all Christians called to imitate the love of Jesus and his mother. “Our wish, our object, our chief preoccupation must be to form Jesus in ourselves, to make his spirit, his devotion, his affections, his desires and his disposition live and reign there. All our religious exercises should be directed to this end. It is the work which God has given us to do unceasingly” (St. John Eudes, The Life and Reign of Jesus in Christian Souls).